Did you know that Lake Winnipeg is the 10th largest freshwater lake in the world? Did you also know that the water drainage basin includes waters from Western Canada, including the provinces of Alberta, Saskatchewan and Manitoba? On the East, the waters from North-Western Ontario end up in this lake. On the south end, waters from the states of Minnesota and North Dakota flow northwards to Lake Winnipeg. All the waters end up going north to Nelson River and ends up in the watershed of Hudson Bay which is also one of the largest in the world. In order for future generations to enjoy this water and these types of sunsets, we all need to take action now to ensure that pollutants are not dumped intentionally or haphazardly in error into the water system. As the Aboriginals or First Nations People say, we should make decisions based on the concept of “Seven Generations” which mean we need to consider the next 7 generations and how it will affect them. 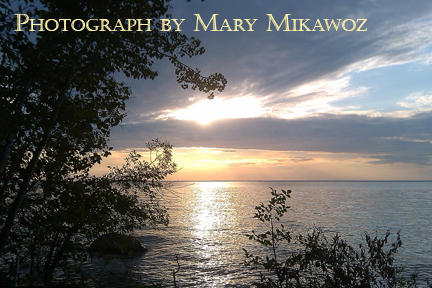 Please press on this link to see a bigger image: http://fineartamerica.com/featured/sunset-at-lake-winnipeg-mary-mikawoz.html?newartwork=true Thank you for checking out my creative work.